I almost finished my driftwood kayak rack earlier this week but was a few sticks short of a complete rack. So off to the Alameda driftwood repository at a secluded part of the island. This particular part of the island is situated in such a way that late winter high tides co-inciding with storms blowing from the south pile up consideral amounts of lumber on top of the riprap that re-enforces that part of the shore. Pictures follow. 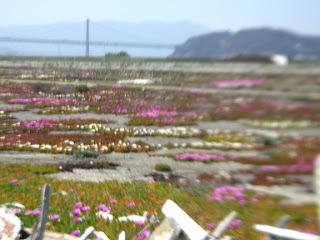 Ice plants were in bloom and the view was unusually lovely. 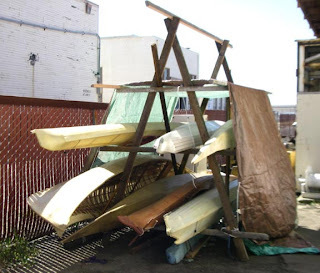 I managed to find two 2x6x10's nailed together, threw them in the water and towed them back to the shop. Successful outing. The view toward the bay bridge. The pictures turned out blurry. I had the camera inside my pfd. Must have fogged up the lens. 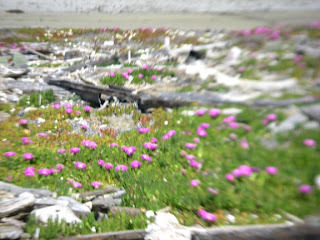 Still, the flowers are pretty in an impressionistic sort of way. The dark blue blob to the right of the bridge is Yerba Buena Island. The light blue blob in back of the bridge is Mt. Tamalpais. Here's the wood, all shapes and sizes. I can't remember if it was the spot in your photo or the section of tideland closer to the Bay Bridge, but there used to be bunches of "junk art" installations around there. I remember waiting to see if there were any new ones everytime I passed by the area. I had completely forgot about that until I saw your photo.